So I hear it’s cold and snowy up north. I hear that the snow is pretty and all that, approved but you’ve all had enough of it. I guess it’s not a good time to complain about the temperatures dipping into the 40’s here tonight. And I probably shouldn’t boast about how delicious the weather’s been for outdoor dining. That would just be mean. So instead I’ll offer up a soup recipe that begs for cold winter days. It all starts off with merguez lamb sausage. If you’ve never had it, let me tell you – you’re missing out. This sausage is bright red, spicy and piquant. Because it’s seasoned with harissa, it has a subtle Middle Eastern spice that gives this soup such great flavor. If you can’t find lamb mergeuz sausage, you can definitely make your own by mixing ground lamb with a couple spoonfuls of harissa. If even that sounds like too much work, you can always substitute Mexican chorizo or spicy Italian sausage, though the flavors are not the same. I made little meatballs from the sausage and browned them up. Then I sauteed onions and carrots in the same oil to infuse them with meaty goodness. All of that is simmered in beef stock with collard greens until tender, then the meatballs are added back along with some whole wheat orzo. Ladled into a big bowl and dusted with freshly grated Parmesan cheese, this soup was better than I expected. Meaty, but still full of vegetables and whole grain pasta. One of the most satisfying lunches I’ve had this year. Make mini meatballs (about 1/2-inch in diameter) from your sausage and set aside. Set a large pot over medium heat. Once it’s hot, heat up the olive oil for a minute, then add half of your meatballs in a single layer. Brown for 2 -3 minutes on each side, then remove to a plate. Repeat with the second half of your meatballs. Add the onions and carrots to the pot and saute until the onions are almost transparent – about 7 minutes. Add the stock, collards and carrot greens. Cover, reduce to medium-low and simmer for 15 – 20 minutes, or until the onions, carrots and collards are tender. Add the orzo to the pot and place the meatballs back in. Cook until the orzo is almost al dente – about 8 minutes, then add the vinegar and salt to taste. Cook for another minute. Serve with a dusting of freshly grated Parmesan cheese and more carrot greens as garnish (optional). *If you can’t find lam merguez, you can make your own by combining ground lamb with 2 tbsp. harissa, or you can substitute spicy Italian sausage or Mexican chorizo. I adore the sound (and look!) of this! I’d like to make my own harissa to have on hand – it can be hard to find that type of sausage up here in Minnesnowta but I like the sound of making the sausage mix yourself. Love love love this. 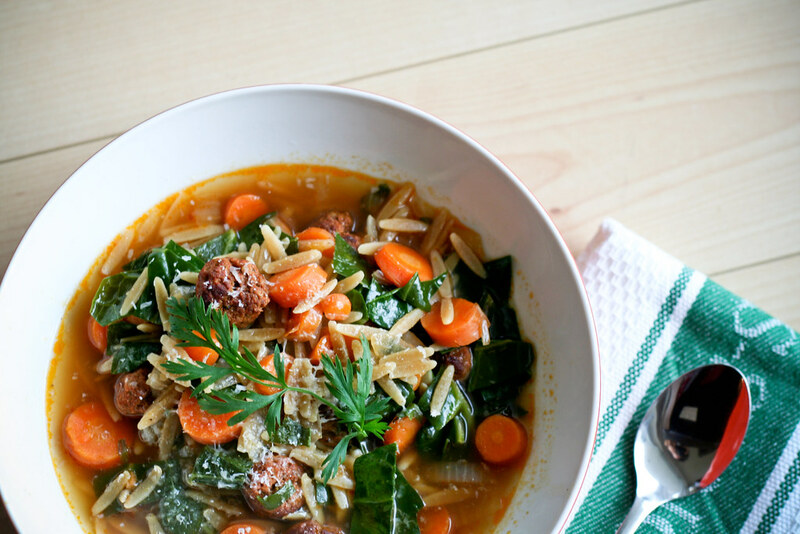 It’s not that cold in Texas, but the chill in the air begs for soup for lunch. I’ve never made a soup with meatballs but can imagine it. I like how you sauteed the veggies in the oil from the meatballs, great flavor punch. We will have to try this or something similar, since I don’t know where to find the lamb you described. Sounds delish, so all you need to do is mix harissa with ground lamb?? Also is the soup oily from the initial browning of the meatballs?